Israeli injured in collision as suspicious vehicle makes u-turn to avoid soldiers, who fire at car tires. A group of Border Police officers arrested the Arab driver of a suspicious vehicle following a chase, the Kikar Hashabbat news site reported. 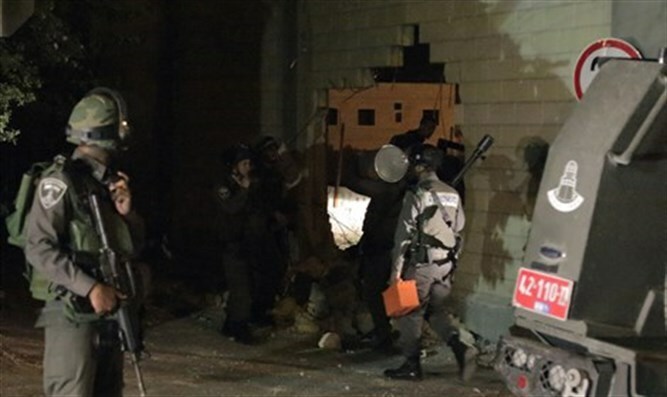 The officers were operating near the Palestinian Authority town of Deir Qaddis in the Modi'in Illit area on Thursday night when they noticed the suspicious vehicle make a u-turn to avoid them. The vehicle collided with an Israeli car during its sharp u-turn. The officers who witnessed the incident immediately left their own vehicle and ordered the driver to stop. When the driver did not obey their instructions, the officers fired warning shots into the air. When the driver continued to attempt to escape, the fired at his tires, leading to his apprehension and arrest. The suspect was identified as a resident of the PA town of Ni'lin in his 20s. An Israeli was lightly injured in the vehicle collision. A Border Police Spokesperson said: "The vehicle, which was unregistered, was impounded, and the driver was transferred for questioning."